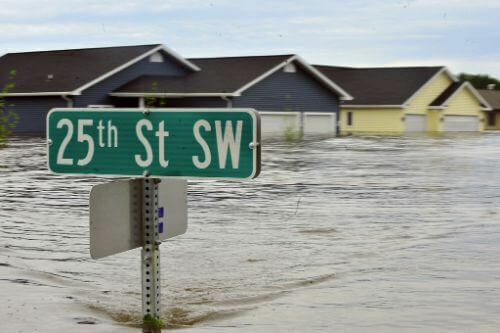 What are my tenant rights in case of a flooding ? Home / Help & Advice / Repairs and safety / A Tenant Asks – What are my tenant rights in case of a flooding ? A Tenant Asks – What are my tenant rights in case of a flooding ? Tenant Asks – What are my tenant rights in case of a flooding ? It’s horrible for your house to get flooded, but in the UK, it’s an uncommon sight. The Royal Institute of British Architects estimates that about 1.7m homes and 130,000 commercial properties are at risk from river or coastal flooding in England alone. Not to mention the less severe (but equally unpleasant) domestic floods like pipe bursts, drain blockages and other plumbing malfunctions. The landlord is required to repair the property and replace unusable furniture and equipment following a flood! Fortunately for tenants, it is the landlord’s responsibility to repair and replace any broken equipment, furniture, carpets etc. Also, the walls, doors, floors and other aspects of the property need to be checked for water damage and repairs if needed. The landlord should further cover the costs of repainting, cleaning or other services required to return the property in it’s previous condition. In Rui’s case, their landlord should cover the cleaning bill and repair any water damage, or replace unusable items, like the carpets. The actual tidying is up to him (or her), but this wouldn’t be such a burden. The question only discusses the carpets, but Rui should also check the electrical appliances situated on the floor and test if they are working property and safe for use. If any of them give defects, the landlord should come back and repair them as well. This law applies equally to private landlords, local authorities (councils) and housing associations – private registered provider of social housing (PRPSH) or registered social landlord (RSL). If any of the above is destroyed or damaged, the landlord has to replace or repair it. However, if the tenant, their family or guests have caused the damage, regardless of the intent, they are liable to pay for the cost of repairs. The law only protects you (the tenant), so long as you are innocent of the damage. This law only regards the property and its contents which are owned by the landlord. You own belongings, like additional furniture or electrical appliances are not the responsibility of your landlord. He or she is not by any means required to compensate you for their losses. If Rui’s flat screen TV is damaged as a result of the flood, then the landlord wouldn’t be responsible for its repair or replacement. If you’re renting an unfurnished house, or just have a lot of personal property in your house, it’s a good idea to pay for contents insurance when you move in. This insurance is meant to protect your belongings in such occasions as fire, floods and other damages. Provided you have such an insurance, your provider will be obliged to compensate you for any losses sustained by the flood. What if the property is uninhabitable ? Depending on the layout of the property and specific occasion, it may be partially or completely uninhabitable. Some floods can easily render the property uninhabitable if all the rooms are on the ground floor. Private landlords are not obligated to provide alternative accommodation during the repair works. However, if property is so badly damaged that the aspects discussed in section 11 up above are unavailable for use, tenants can claim rent reduction or rebate for the period between the flood occurring and all essential repairs are completed. Council landlords and housing associations have to provide alternative accommodation until the repairs are carried out. If your landlord denies to move you to a new suitable home, until yours is repairs, you have to contact Environmental Health at your local council and request their aid. Follow their advice about how to proceed with the situation. For Rui’s case, the landlord should be open to reducing 20% to 25% percent of their next month’s rent, since they stayed in a hotel for 5 days waiting for the repairs to be done + maybe 1 additional day when the flood occurred. Alternatively Rui can request their hotel bill to be repaid and the matter resolved. However, the terms of repayment / compensation should be negotiated and agreed upon before the tenant actually moves out. Whether the property is habitable or not can be subject to dispute. If you move out of the property and your landlord refuses to pay for your accommodation during the repairs, you will have to seek the court’s help in recovering the funds. If the flooding is severe and repairs would last more than a few weeks, you have to negotiate the terms of your tenancy. Obviously, you should arrange for rent payments to be suspended until the property is fit for occupation again, but you have to consider whether or not you should terminate your tenancy as well. Sometimes, it’s better to just leave with the landlord’s blessing and look for a new home. If you think your landlord will be difficult about rent rebates or reductions, you should prepare in advance and document the state of the property and severity of the flooding and water damage. You have to take photographs and even videos of the damage, source of the flood and the utilities or rooms that are unusable because of the flood. If possible, you should get somebody in the property to write a statement confirming the footage you’ve taken. It’s important to do this before the repair work starts, or you lose your chance forever. If any court dispute follows, this footage and the witness statement should be the perfect evidence. You should also save every receipt from hotels, restaurants and services you’ve used during the repairs. Some of these might be refundable as costs suffered due to the flooding. A very good example is miss Amanda Slatter, who recently endured a nasty flooding of her home by sewage from upper floor apartment. In a story published yesterday on GetReading, you can see a brief, but very clear video of the flood miss Slatter endured. The article features a clear response from David Millward – the rep – that all damage and repairs are being briefly dealt with. As with any damage situation, tenants also have responsibilities. As the person on spot, you should do your best to limit the damage to the first affected room or area. Of course, these measures only apply to small floods most likely cause be internal damage, not natural disaster. If you feel like you might be endangered by staying inside the property, you should collect your essential belongings, like documents, money, valuables (jewellery, gold, etc) and mobile phones and evacuate the property. If it’s a pipe burst, you have to immediately shut the main valve and stop the spilling water. You should line the doors of the affected room with towels, rags and other cloths to prevent water from entering the adjacent room and causing more damage. If water is coming from the ceiling, use a bucket to collect the excess water and prevent it from causing any damage to the floor. When you’ve gone through the basic containment setup, you should call your landlord immediately and send them an email at the same time, to document the timestamp. Make sure they are aware of the situation and are on the phone looking for repair companies to fix the problem. If you have a letting agent, also phone their office and make sure they’re looking for a solution ASAP.